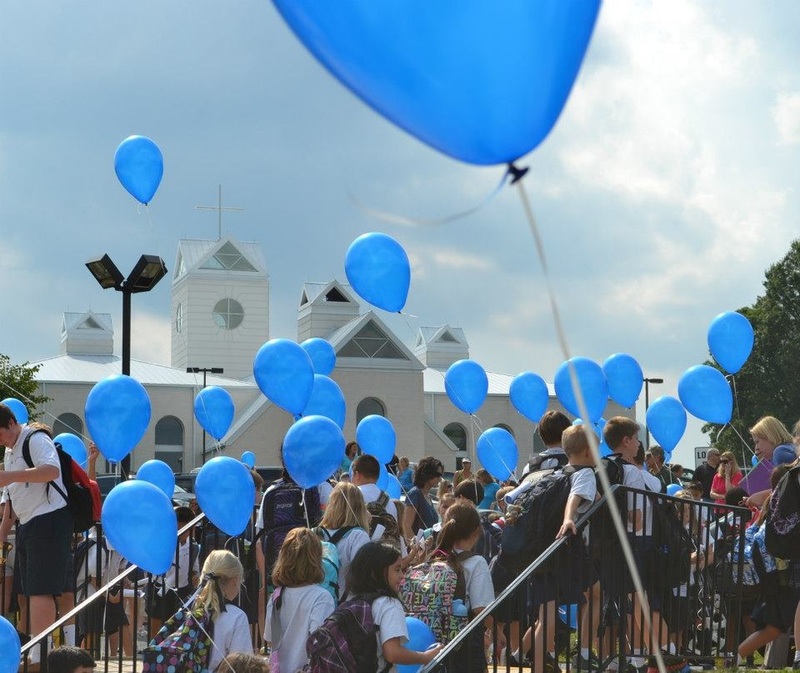 Saint Peter’s School is a 2012 National Blue Ribbon School of Excellence. A school is eligible to apply for the Blue Ribbon of Excellence if “ the achievement of the school's students in the most recent year tested places the school in the top 15 percent in the nation in reading (or English language arts) and mathematics as measured by a nationally normed test”¹. Saint Peter’s standardized test scores continue to place us in the top 15% in the nation in Reading and Math. ​Saint Peter’s graduates earn acceptance at many highly-regarded high schools in the Washington metropolitan area. 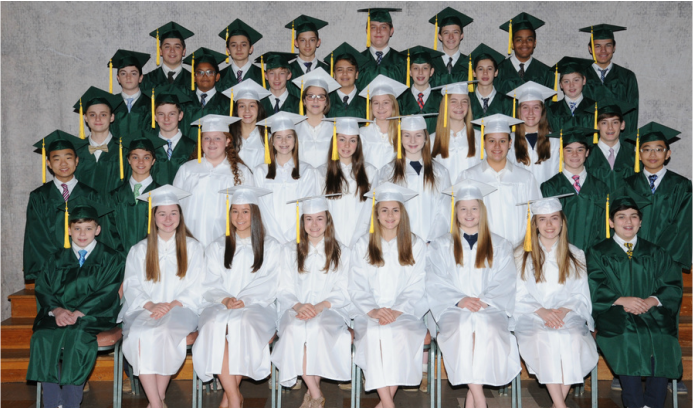 Recent graduates have been accepted at The Academy of the Holy Cross, DeMatha High School, Georgetown Preparatory School, Georgetown Visitation Preparatory School, Gonzaga College High School, James Hubert Blake High School, Our Lady of Good Counsel High School, Sherwood High School, St. John’s College High School, and Stone Ridge School of the Sacred Heart. Our graduates regularly test into Advanced and Honors level classes. Students who complete the honors or enrichment math course in 8th grade successfully test out of Algebra I in high school. Every year our students are offered high school scholarships in the areas of academic excellence, visual and performing arts, band, and leadership. 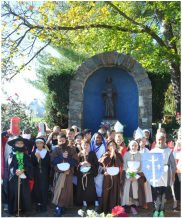 Saint Peter’s is committed to enriching the curriculum with a strong arts program. Visual Arts classes focus on giving students the opportunity to explore and experiment with a wide variety of materials and techniques. Introducing students to a variety of artists and art forms helps children discover their creative strengths, expands their cognitive thinking skills, and teaches them how to conceptualize their ideas visually. After-school art classes are offered for students who want to explore beyond what the regular curriculum offers. Vocal music classes provide an opportunity for students to learn the elements of music and to develop an appreciation for different styles, cultures, and experiences. Students in grades 4-8 are invited to join the choir that sings at all school Masses and school events. An award-winning instrumental band program is available to students in grades 4-8. After-school keyboard and guitar lessons and art classes are available to students who want to deepen their experience in these areas of the Arts. In 2014 Saint Peter's joined Project Lead the Way (PLTW) as the first school in the state of Maryland to implement Launch, the PLTW curriculum for elementary grades. Teachers at all grade levels present science, technology, engineering, and math challenges that require students to work collaboratively, using high level thinking skills, to solve real life problems. Through PLTW Launch teachers participate in training that equips them with the content, skills, and pedagogy required to teach PLTW courses. Students engage in design problems that use technology, robotics, and everyday materials to explore topics such as energy, light and sound, motion and stability, and gravity. PLTW Launch inspires in students a passion for and confidence in STEM subjects, encouraging them to continue to explore and study in these areas.